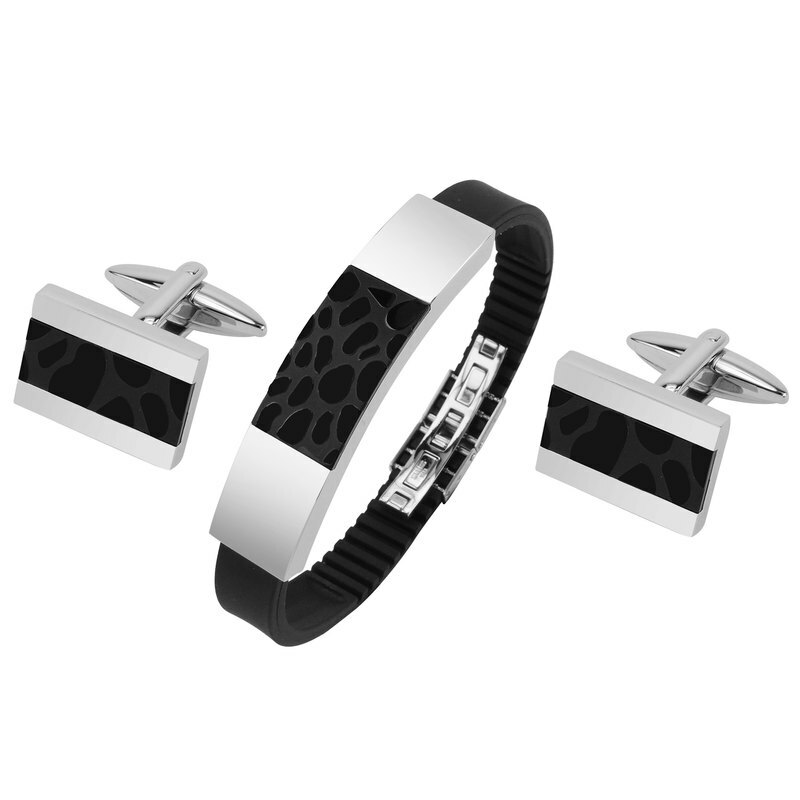 Stainless Steel Two Tone IP Black Cufflinks and Bracelet Set - Handmade by professional workers - Fine polished - High end mens fashion jewelry made of stainless steel - Gift set including one pair cufflinks and a bracelet - Packed with gift box - Best gift for man Size - Cufflinks: approximate 18x13x3mm - Bracelet: approximate 72x10x3mm - Gift box: approximate 200x163x56mm Material: Stainless steel Color: Silver+Black Parts: N/A Delivery: . SF Express: Mainland China, Hong Kong, Macau, Taiwan . DHL: international delivery Care label: - Please use soft cloth for general cleaning. - Please keep your gift set in a dry and clean environment. - Store the gift set in storage cases - Store the set separately so as to not scratch other jewelry items. Our Story: Fashion is a lifestyle, not only for women, but also for men. More and more gentlemen show interest in fashion accessories to express their personality and fashion taste. A good accessory can be timeless, elegant and modern. After working in men’s accessories for more than 15 years, with our rich experiences in manufacture and export for many international brands, our own brand “CUFF IT” was established. CUFF IT is aimed at providing gentlemen with high-end, stylish and classic cufflinks, tie clips, lapel pins and other accessories. We have creative design team to study the latest fashion trends; professional workers to manufacture high-quality products; excellent sales and after-sales team to provide pleasant customer service. Following up CUFF IT, get your own cufflinks here!